Mars in Leo aligned to the August Eclipses. Whoopee! An intense Eclipse Season is again upon us, this time aligned to the axis Leo-Aquarius (and indirectly to Taurus-Scorpio) and made livelier by being associated with Mars. The Eclipses are: a Lunar at the Full Moon in Aquarius (opposite Sun-Mars conjunct in Leo) on August 8, and a Solar at the Leo New Moon, on August 22, aligned this time to Uranus in Aries, the traditional Sign of Mars, while Mars itself will be by then conjunct the Moon’s North Node, an interception point on the Earth orbit which is connected to Eclipses. The Mars theme is obviously strong at this time, enhancing the possibility of confrontations, conflicts and escalation of issues that may have been dormant for a while. In a positive sense this means a clearing of the air and a healthy moving away from stale situations, especially after the second Eclipse. The August 8 Lunar Eclipse represents in fact a climax of some kind, when things are revealed or realized, while the Solar Eclipse, on August 22, signifies a cutting off from the past and a radical new start. Mars, the main catalyst of all these cosmic energies, will be transiting Leo between July 20 and September 5. When Mars moves Sign, every two months or so, a shift occurs in the way we act out our desires, assert ourselves and defend ourselves from real or imagined dangers. Naturally people with different planetary placements in their Birth Charts will respond to Mars’ changing energy in their own individual way. Mars in Leo provides the type of energy that can be spontaneously channeled into creative activities. The energy should be high and focused. Brightness and warmth accompany this placement when found in a Birth Chart. Collectively also this Mars’ position can provide added warmth, brilliance and passion to everyone’s life. Mars will remain in Leo until September 6. Leo is considered a positive placement for Mars, providing the fiery passion the Red Planet feeds on, but also containing that passion and controlling it, enabling us to utilize the positive energy for creative and enterprising feats. A case in point: the transits to the Birth Horoscope of USA President Trump. 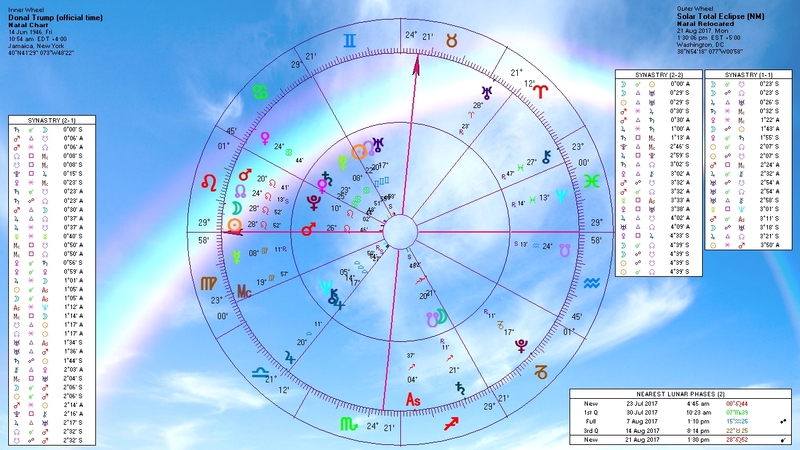 Around the time of the Lunar Eclipse, on August 8, transiting Mars will be aligned to Trump’s Birth Pluto (one explosive conjunction, like putting a live match in a keg of dynamite); while, during the second event, Mars will be close to his Birth Mars and the Solar Eclipse degree will be in near perfect alignment to his Birth Ascendant (born in NY on June 14 1946, official time 10.54 am). Both Mars and Jupiter are soon due to return to his Birth Horoscope’s positions, marking endings and new beginnings. At the same time Saturn is forming the last alignment to his Moon (conjunction) and Sun (opposition) in August and September, the same transit active since his presidential inauguration, making the job itself feel very hardous to Trump, the routines tiresome, the responsibilities heavy. All these combined factors further stress the significance of this period in his life. The first New Moon in Leo occurred on July 23 2017, at 7.45 pm. The New Moon fell on the same day the Sun entered Leo (1.15 am), and just about an hour after the ingress of the Moon in Leo (6.33 pm). Because that New Moon was at the very beginning of the Sign there will be another Leo New Moon on August 22, on the 28th degree of Leo, just before the Sun‘s ingress into Virgo. This latter New Moon will be the Solar Eclipse spoken of before. Collectively, to add to the intensity of all the above, Libran Jupiter will be forming its last major alignments to Uranus and Pluto (before entering Scorpio on October 10): a right angle to Pluto in Capricorn on August 5 (close to the Lunar Eclipse) and an opposition to Uranus in Aries on September 28. In this case the Cardinal Signs are highlighted, also showing that accelerated changes, even upheavals, are now possible and the start of brand new phases in the life of the collective as well as many individuals. The role of Jupiter is to help us strive toward greater understanding of our place in the world, lifting us up and out of a too personal outlook on life. Its alignments to two of the most powerful ‘astrological transformers’, Pluto and Uranus, is now matching Jupiter’s widening of perspective with greater willingness to embrace radical changes, even if it means cutting the roots of deep attachments and lifelong habits. Finally to make the period even more ‘interesting’ Mercury will turn Retrograde between August 12 and September 6, from Virgo back into Leo. To read more about Mercury’s Retro period please navigate to my July post HERE.